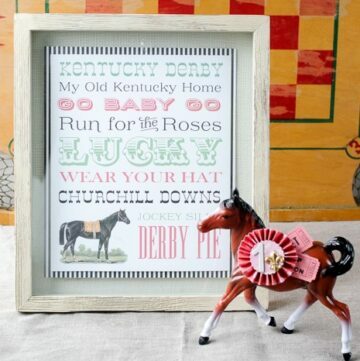 Jumping on the Kentucky Derby bandwagon today and sharing a few ideas for some fun Derby Craft Ideas. 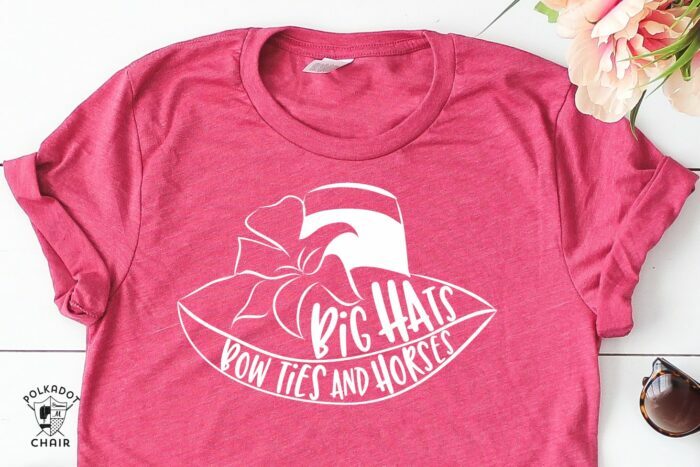 If you’re looking to add a bit of Derby Style to your home or your Derby party then I think you’ll love these Derby inspired SVG files designed to work especially with your Cricut Machine! If you’re not super interested in the Kentucky Derby, no worries! I’ve designed them to be universal enough that you could use them for lots of different occasions! Hi Guys, If you’ve been a long time reader then you know that I live in Kentucky. I didn’t grow up here but came to live here as an adult and I love it. One of the most fun things about living in Louisville is what a big deal the entire city makes about the Kentucky Derby. It’s the first Saturday in May every year and I try each year to make a few new things to add to my collection of Kentucky Derby Decorations. This year I’ve designed 3 SVG Cut files for you that are all inspired by the Kentucky Derby. You can use them to add to tote bags, t-shirts or pillows (or whatever else you may dream up!). 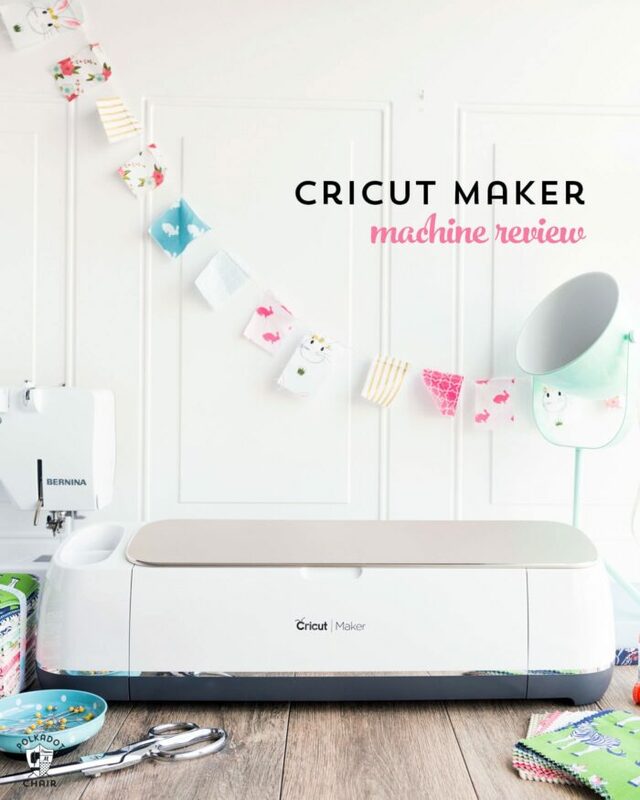 I love creating files to use with my Cricut machine… I work as a paid ambassador for Cricut, but this is NOT a sponsored post. Just one that I did because I love using the machine so much! Now, I know that not all of you love the Derby and all things that go with it. 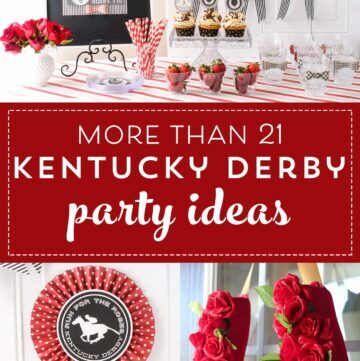 So when I was designing these Kentucky Derby Craft ideas, I designed them with everyone in mind. 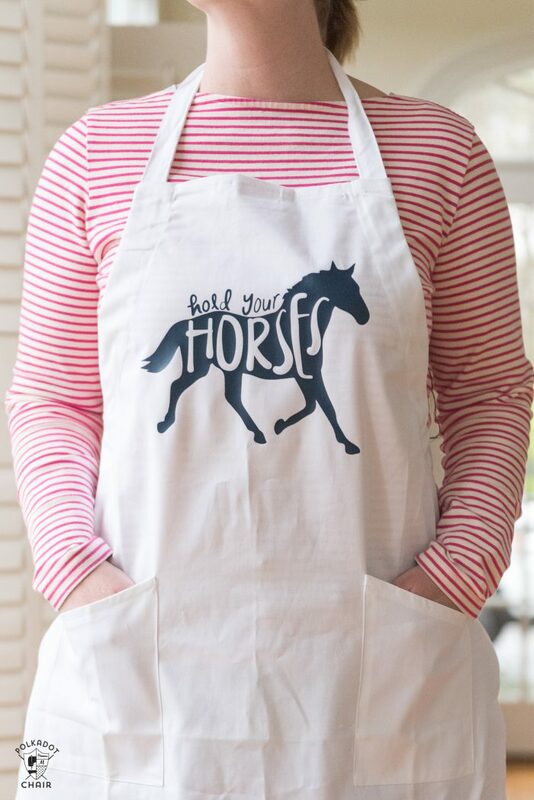 There’s a super cute “hold your horses” apron that anyone could wear, and a “lucky” pillow that would also be great as a St. Patricks Day decoration! They would also be fun for anyone who just loves horses, regardless of where you live! 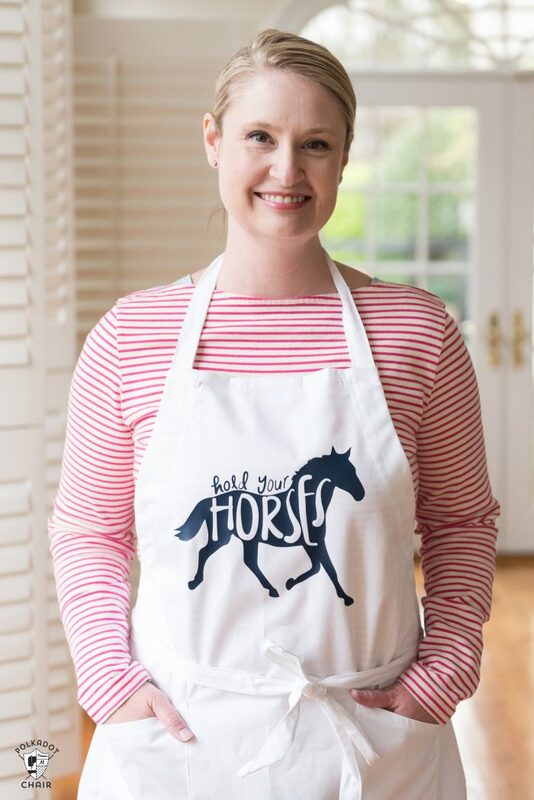 I mean, as a mom don’t you sometimes want to scream “hold your horses” when your kids are bugging you for dinner for like the millionth time?? All of these items are designed to work with “e” cutting machines. I use the Cricut Machine. You can get it online or at most big box craft stores. 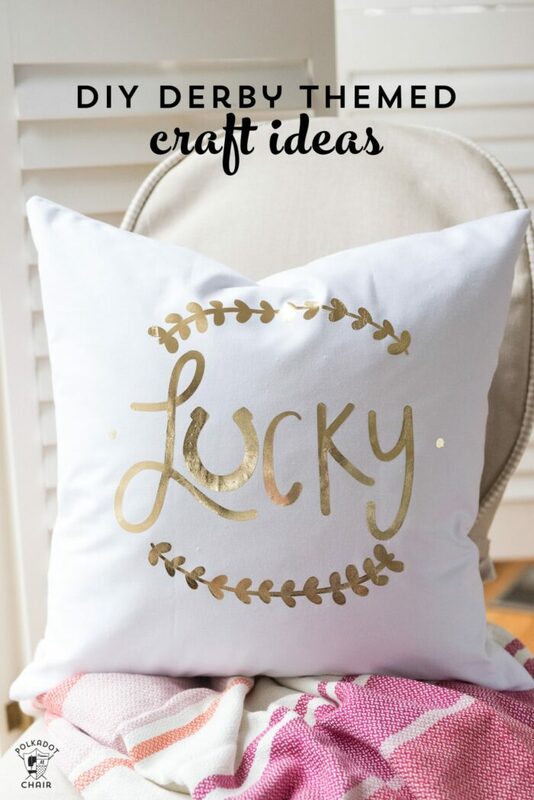 I’ll link to a few of my most popular Cricut “how to” tutorials at the bottom of this post just to help you out. 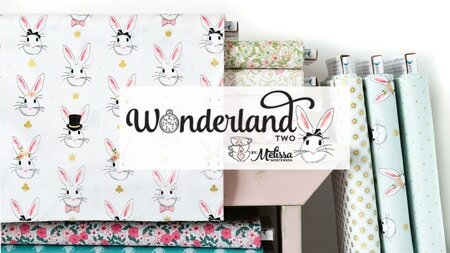 All of these projects were hand-lettered by myself and my daughter. 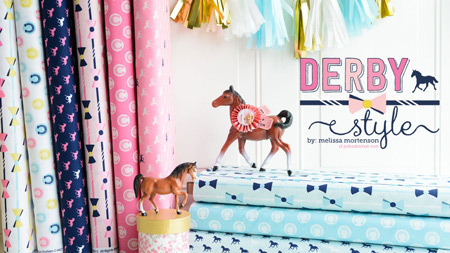 A few of the images even came from my Derby Day Fabric collection that’s now in stores! 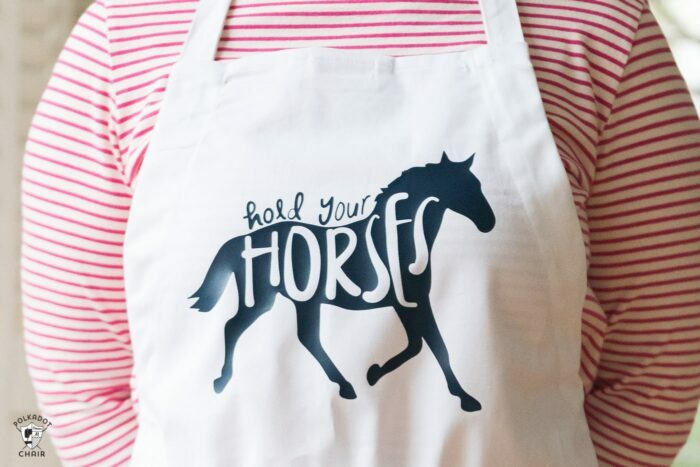 When I designed the “Hold Your Horses” graphics, I did it with the idea to put it on a t-shirt to make your own Derby shirt. 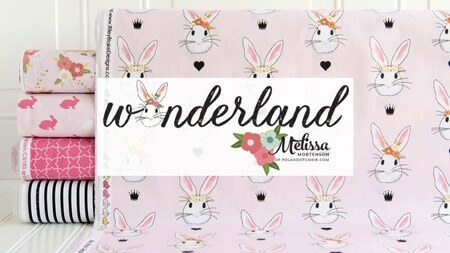 Then I started thinking about it and realized it would be adorable on an apron. 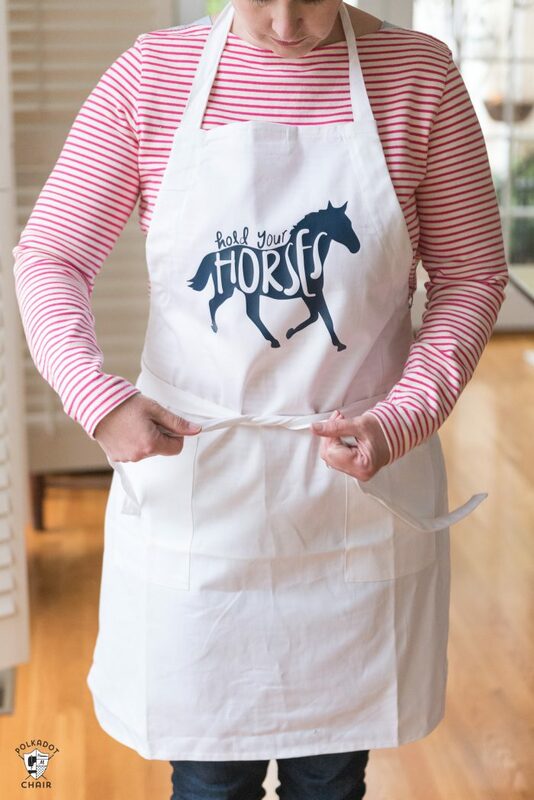 Just the perfect thing to wear if you’re hosting a Derby party and you’re doing all the cooking! Every year I like to get a new Derby shirt to wear. 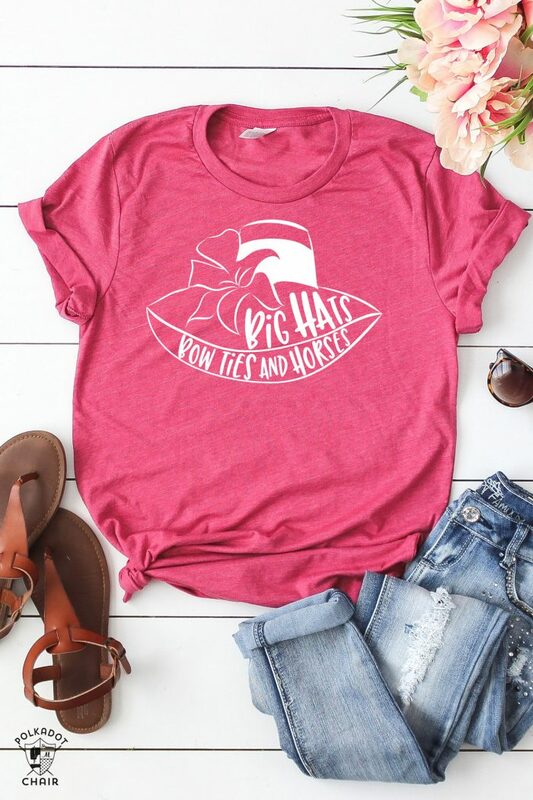 You can find them online and around town pretty easily. This year I thought, why not just make my own. 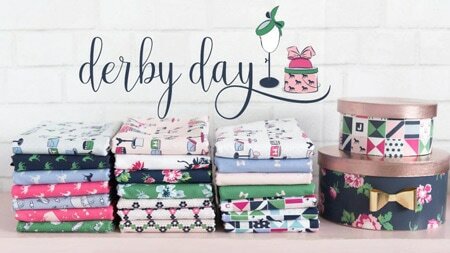 I took one of the hat images I drew for the Haberdashery print from my Derby Day Fabric line and added some fun words to them! Big hats, bow ties & horses sum it all up pretty well. You could also add “bourbon” in there, but I’m not a drinker so it would be weird for me to wear a t-shirt like that! 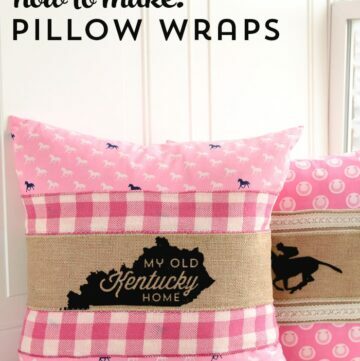 I created the SVG file for this pillow for the derby, for obvious reasons! 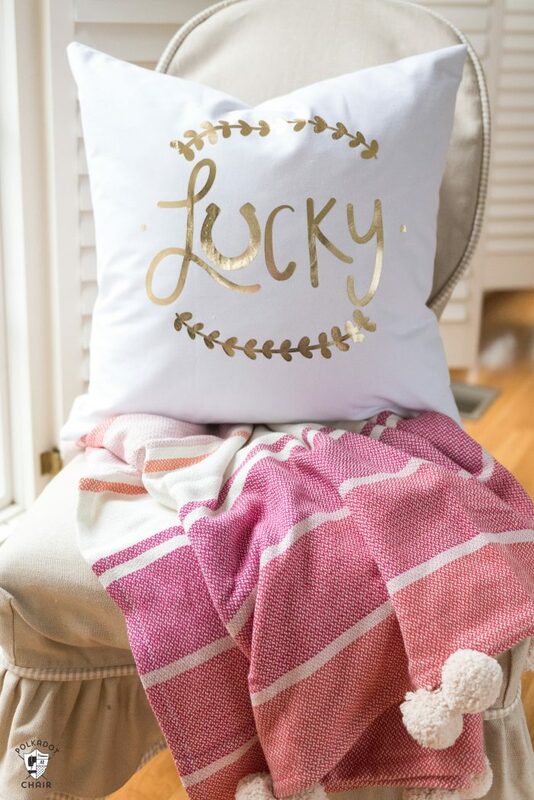 It would also be so cute for St. Patricks day or really any day for that matter, who of us couldn’t use a bit more luck? 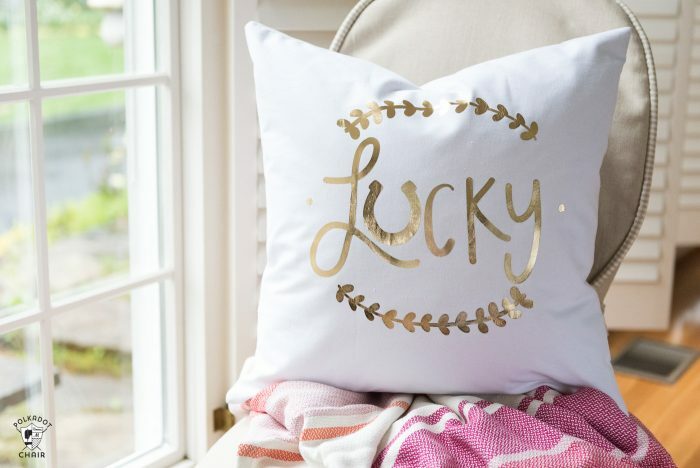 The iron on is created with gold foil iron- on from Cricut and I LOVE how it shines! 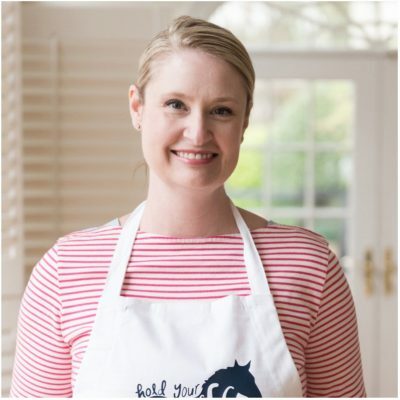 To get the files to upload to your computer then cut out with your Cricut Machine, just click on over to the FREE CRICUT DOWNLOADS “shop” page on our site. Just follow the instructions on the screen to download the files. After you’ve done that, you can follow the instructions HERE to upload, cut out and iron your images on to your items. Let me know what you think! I’d love to hear what you’re making with the graphics! Kentucky Derby Party for a Crowd! Your post for Kentucky Derby ideas touched my heart. My husband was an avid horse racing enthusiast and would have his horse all picked out months ago. In honor of him I have a couple Kentucky Derby car accessory items in my Etsy shop. We never made it to the Derby but Saratoga Springs was always on our list every summer. Thank you for your lovely post and ideas.